Heat a pot. Add olive oil. 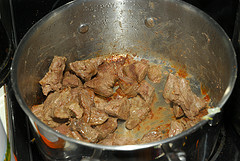 When hot, add the meat to seal in the juices and brown the meat. Seal all sides. When browned, cover with water. Add the entrails, onion, fennel, cilantro and rue. Bring to a boil. Reduce to moderate heat boil gently until the meat starts to fall apart. Add garlic, pepper and salt to taste. Serve over rice. Variations included meatballs or intestines filled with bread and egg. Within the Alhambra there was a slave class system. The more important the slave, the better he was fed. A prize slave received the liver, for example, while a less important slave received part of the bread and egg sausage. The darker the skin of the slave the more prestige he had. 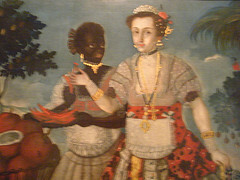 The Arabs in Al-Andalus introduced caraway to the peninsula and applied caraway water to the skin of their black slaves to give it gold tonalities, see alcaravea.